Hi, my lovely Friends! Today I want to share with you one of my favorite nail products at the moment. It's the Cuticle Oil from Astor Professional Nail Care. I got this last winter and fell in love immediately. I've already tried a few cuticle oils but I really like this one and it's probably the best cuticle oil I've ever used. It smells absolutely heavenly and fruity, not chemically at all. The package is in like a regular nail polish bottle, so you can brush it on and it's so much better than dropper or squeeze bottles! The texture is alright, it's a bit too greasy and liquid. It soaks in really quickly, like 5 minutes max. I put the Cuticle Oil onto my cuticle area and whole nail, let it sit for a few seconds and then I rub it in with my fingers. I have very thick and dry cuticles due to washing dishes without gloves and this product makes my nails and cuticles look so hydrated and healthy. 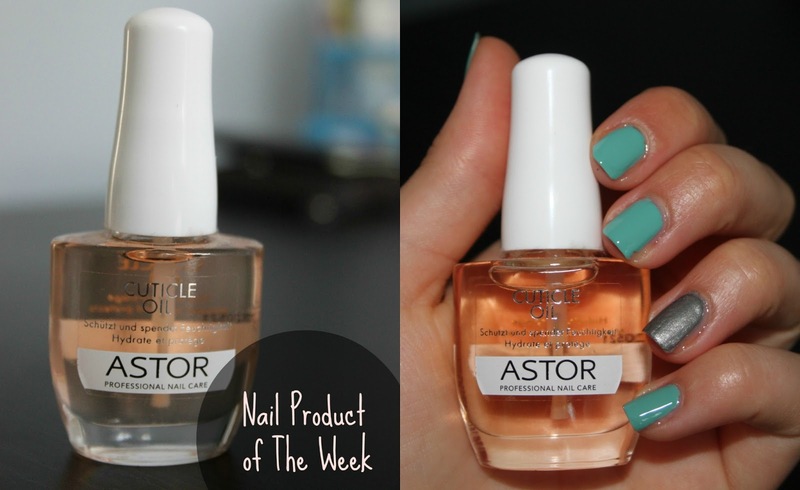 My nails are in the best condition they have ever been thanks to this cuticle oil from Astor. Do you own a cuticle oil? Which one is your favorite?